The first-, second-, and third-born offspring were larger. Unless misleading or awkward letter combinations result, the following prefixes may be used without hyphenation: pre, post, re, sub, super, micro, mini, multi, non. The food co-op bought a chicken coop; re-cover the cage so the birds can recover. twenty-one, ninety-nine a four-to-one vote; three-quarters gone pre-Darwinian anti-inflammatory; pre-existing prepositions. Their most common use is to join compound words (such as cost-benefit analysis). They also form the compound numbers from twenty-one through ninety-nine, and fractions (such as three-quarters) when they are written out. The decision whether to use hyphens with compound words - or omit them -often requires the aid of a good unabridged dictionary The classical rules governing this set of uses are complex, covering such topics as whether the compound word is permanent or temporary and whether the words are so closely associated that they constitute a single concept. As a spelling device, the hyphen is supposed to make life easier, but attempts to detail all its various uses tend to only increase the hyphenation confusion that many writers feel. In addition, the rules are changing, and even the authorities do not always agree. The use of hyphens in scientific writing clearly is declining. Although some rules still seem to generally apply (Table 7.2), there is a strong tendency either to form new single-word terms or to use strings of modifiers without hyphenation. Consult your intended publication for evidence of any strong prejudices, consult a standard dictionary for specific guidance, and then above all, be consistent. Hyphens are also used to divide words at the ends of lines. Such divisions are made between syllables, but not all syllable breaks are acceptable end-of-line breaks. (Consult a dictionary.) Automatic hyphenation done by some word processing programs can produce some unusual word divisions. In general, it is best to turn off the automatic hyphenation option on such programs. The main context in which this hyphenation role occurs is in the production of camera-ready copy Much typesetting today is done in "ragged-right" style, with lines left unjustified so that the right-hand margin of the type column is irregular, but occasionally you may be asked to produce text that is "justified" (aligned to both margins). If justification is done with no hyphenation, the spacing between words is adjusted, sometimes to the extent of looking very strange. When type is set in justified lines with hyphenation, it is inevitable that some words will be broken. Such text looks attractive, but it can be difficult to read. Furthermore, if a typescript is submitted in this style, there is a good chance that at least a few line-end hyphens may be carried over mistakenly as obligatory hyphens in the typeset copy. Unless your intended journal specifies otherwise, don't justify the text. By submitting ragged-right copy, you will minimize the chances of accidental erroneous hyphenation in the typeset copy. Correct the punctuation in these sentences. 1. Indicate optimum instrument settings for temperature humidity rainfall and performance. 3. Class Echinoidea which includes sea urchins sand dollars and heart urchins is not closely related to class "Ascomyceteae." 4. The adults are radially symmetrical but the larvae are bilateral and it is generally held that this phylum evolved from bilateral ancestors and that radial symmetry arose as an adaptation to a sessile way of life. 5. The clinician asked, How did the patient die? ; the answer was not obvious. 6. The essay, The Future of Veterinary Medicine, appeared in the early 1960's. Usage varies, and almost every rule has exceptions and variations. This confusion is more apparent than real, however. 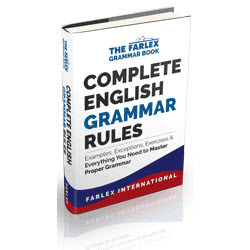 Most capitalized words are proper nouns, major words in titles, or first words of sentences. However, a few problematic situations recur commonly enough in biomedical and biological writing to be worth special note. If you still have questions on capitalization of specific words after reviewing the guidelines below, consult a standard dictionary and follow its lead.